I am hearing that people are being killed in Kibera. Kibera is one of the largest slums in the world with a population of one million. Yahoo News reports that Kikuyus were being hunted down in the alleys but Charles Digges accompanied government soldiers on a foot patrol through Kibera last night where he witnessed Odinga supporters being attacked and left for dead by soldiers. Kikuyus were fleeing the slum with their belongings. Kenyan Pundit also says that there has been a run on the shops in Nairobi. Food supplies are dwindling and the situation can only get worse as business in the city has come to a complete halt. In the meantime Uhuru Park has been surrounded by GSU to prevent the planned ODM meeting from going ahead today. Kumekucha says that Odinga’s inauguration has been put off until 3rd January 2008 and that he has set up a “parallel” government. UPDATE: BBC News24 is reporting on tickertape continuous updates on Kenya – Odinga is calling for mass action on the 3rd – this is somewhat different from the news heard that it is to be an inauguration. He expects to 1 million of his supporters out on the streets. CORRECTION:“We are calling for mass action, peaceful mass action. We will all the time inform the police of what is going to happen and there will be a peaceful procession,” Odinga announced today in the presence of the Canadian Ambassador to Kenya and said he is preparing to present himself as the “peoples president” on the 3rd. 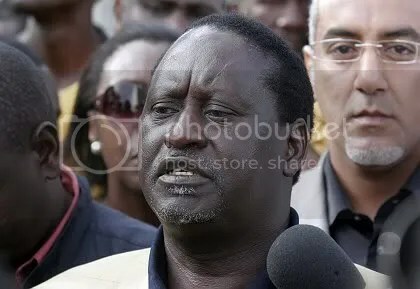 UPDATE: Speaking to Germany’s Spiegel Odinga says that Kenya is undergoing a civilian coup and said “There is no difference between him (Kibaki) and Idi Amin and other military dictators who have seized power through the barrel of the gun”. Thilo Thielke writing for Spiegel reports that Odinga’s supporters are being dragged from their homes in Kangemi and beaten. Even pregnant women are being assaulted with wooden batons. Jesus! In Kisumu GSU surround the morgue where some 43 bodies lie in rest. BBC News24 shows scenes of wailing relatives. Elsewhere the news is not good either, in Eldoret many Kikuyus were killed. The last 24 hours count as the most saddest in Kenya’s 44 year history. It is incredible that Kibaki did not foresee what stealing the election would unleash. It is also incredible that he also does not realize that it will be next to impossible to rule Kenya through the barrel of a gun. Repression will only breed more resentment. What a fool he is. Police have been given shoot to kill orders but this has divided the officers as many of them sympathize with the protestors. A government spokesman denied the reports. UPDATE: BBC News24 is showing scenes of police using water cannon against Kibera residents. 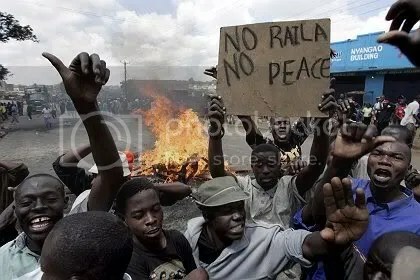 Tear gas and live rounds were also fired into the crowds who were being chased back into Kibera. 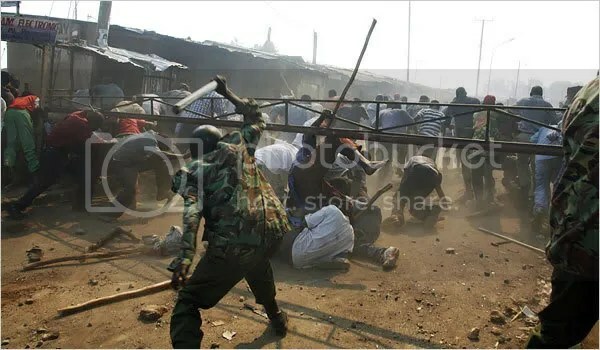 Earlier the police could be seen running through Kibera beating people with batons. One of the police was heard shouting in Swahili “Stones, stones!” At this the police did an about turn and beat a retreat expecting a deluge of stones to rain down on them. Later BBC showed crowds once more attempting to leave Kibera and police reversing slowly in a landrover. The police were charged with keeping Kibera residents from leaving the slum. The BBC reports that the crowds grew bigger and at one point even dared the police to shoot at them. Marching and singing defiantly, the crowds at one point dared the police to shoot them as they started marching right into the contingent of policemen mounted in trucks or on foot.